Parkrose High School student actors Marie Still, Brandon Wilcox, Madison Cook, Jonathan Wheatfall, Anna Moellering, and Tyree Harris act in the film, “The Tail of Nick Rose” to be premi?®red at the Rossi Barn Bash on July 8th. Why the commotion at Rossi Farms? Students from Parkrose High School’s video production and drama classes were working together on an end-of-year project: The class’ new short film, “The Tail of Nick Rose”. This film will be premi?®red at the Rossi Barn Bash’s Theater on the Haybales on July 8. Soundman Taylor Ward and director/camera operator Evin Carr get ready for their next take while shooting “The Tail of Nick Rose”, to be premi?®red at the Rossi Barn Bash on July 8th. And how does the story end? Come out and see it, while you enjoy the best all-you-can-eat BBQ chicken dinner around, grilled by the Parkrose Lions; see a live-action wild-west show; dance to country music ‚Äì and enjoy the first showing of this movie, at this year’s Rossi Barn Bash! 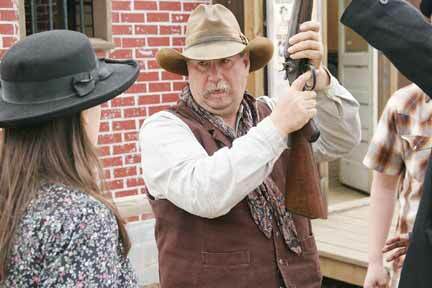 “Turkey Creek Tom” Mannen shows actors how to safely handle the guns used on the Rossi movie set. 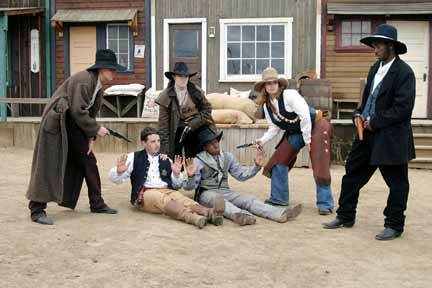 Mannen is the leader of Turkey Creek Productions ‚Äì the group who puts on the Wild West Action Show at the Barn Bash.